Shirdi Sai Devotee Hemavani Balaji from Ireland says: Om Sai Ram. 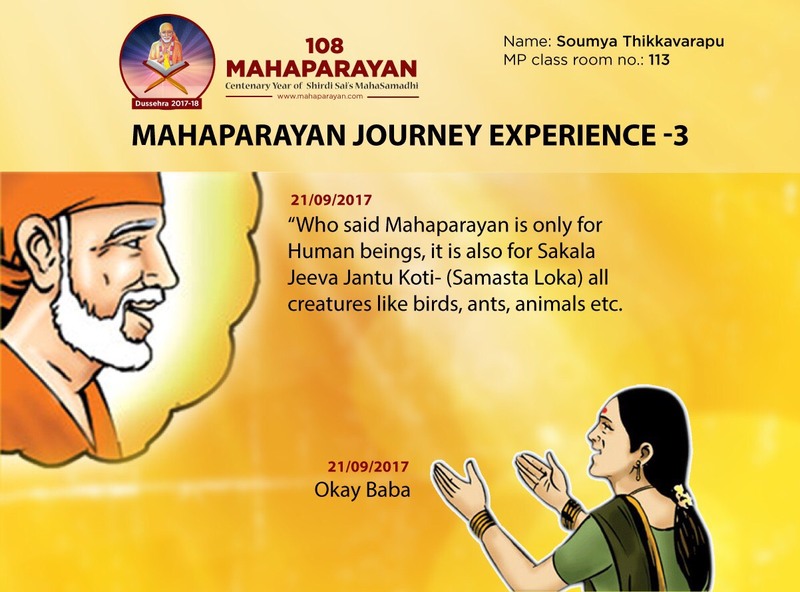 My name is Hemavani Balaji, I am a part of Mahaparayan Group 81. I wish to share a recent experience with Baba. I am a small devotee of Sai Baba from 2013. I was not a religious person before I knew Sai, even though being from an orthodox family. I was introduced to Sai, by my boyfriend. 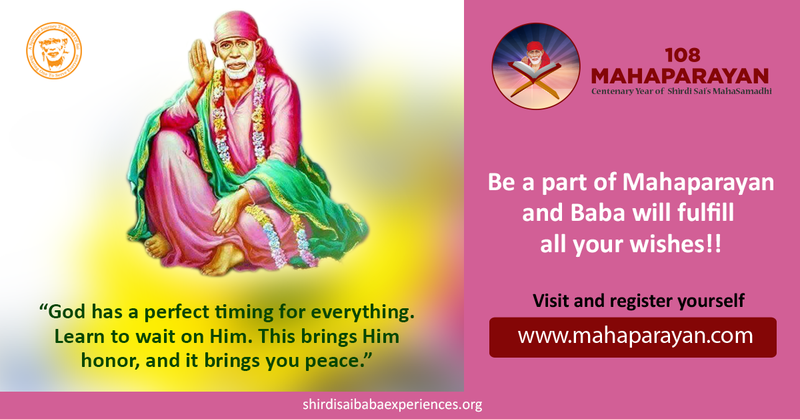 I am going to share my experience on how Baba blessed me with all my needs. I'm in a relationship for past 4 years now, we planned to settle abroad but found very difficult to secure a job. Every single day I prayed to Baba, used to write Om Sai Ram 108 times and did Sai Nav Vrat and read Sai Satcharitra on Thursdays. Luckily by Baba's blessings, I came for onsite which was very rare for a person working in BPS. It's only because of Baba, I got it and working in abroad from past 1.5 years. Last Thursday, that is on 15.03.2018, as I do night shift job, I sleep all the day. Afternoon I got a dream, where I was in Shirdi rushing for darshan of Baba, one pandit announced looking at me that Baba's murti is going for procession. I immediately got up and went to see Baba. Pandit was carrying a big Aarti plate on which Baba's statue was there which was very heavy and of our tall human's height. Pandit handed it over to me. I hold that big plate and another man came to hold the plate. We both were holding and I found difficulty as that man was either pushing the plate up or pulling down the plate down. I said Baba Baba, pandit appeared and stretched his legs long(as if he is a toy, it was funny and I laughed). Shirdi Sai Devotee B Krishnapriya from India says: Sairam. This is my experience with Baba in getting bank job. Please bear with my lengthy post. I completed my Btech in 2015 after that I started preparing for bank jobs as I wanted government job. I used to write each and every exam. As I belong to open category it was very difficult to be in final list for me. Every time I lost by 0.5 marks like that. Then I started reading Sai Satcharitra, Guruchatitra, Sree Padasree Vallabha charitra, used to chant Vishnu sahasranama, Siddamangalastotram,did many Nava Guruvar vrathas, divya puja. At one point of time I lost hope on Baba and started asking Him why these many failures I have to face, these many hurdles to get a job even after doing parayanas, pujas etc.I visited Shirdi, Akkalkot, Pitapuram in these two years of span. Every time I used to ask Him through chits whether I will get through this or not. Shirdi Sai devotee Radhika Kyama from USA says: Sai Ram. My name is Radhika and I want to share how Baba blessed me last Thursday. My mother is also a Sai devotee and few weeks back she started Nava Guruvarah vrat and from that time whenever and wherever I am seeing Baba He is giving darshan to me in yellow shawl only. 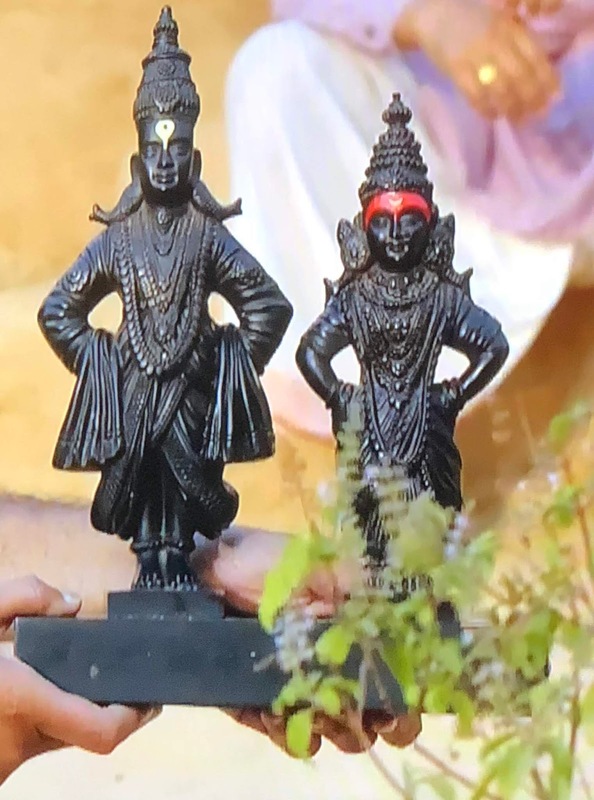 I was like what is this and I remembered long back I was thinking of doing this vrat in my mind but when I don't know. Then I felt like Baba is showing a sign for me to start this vrat. Then finally I planned to start from this Thursday. For this puja we need yellow cloth and yellow flowers then I thought in my mind, Baba if I get everything then I will start it. He showed me yellow cloth and my husband brought one small plant which was having only three yellow flowers, then again I was thinking only three flowers ? I was not very sure since few days I am having full body pains and it's becoming hard for me to get up in the mornings and I am having 4 year old daughter who has recently joined new school and she didn't like the school and she used to cry saying that she won't go to school. Shirdi Sai devotee Keerthana Suresh from India says: Om Sai Ram all, I am Keerthana and a small devotee of Baba from MP-71 Group. Baba made me to part of Mahaparayan, when I enrolled for Mahaparayan almost the last date was over and I didn't have any hope. But Baba sent me His signal and I received call regarding confirmation of that. I was so happy that I am lucky to be part of this. During Mahaparayan I had a wish that I should visit Shirdi during this 100th year as it is very very special year of Baba. February 15th was my wedding Anniversary and me, my husband along with our kids went to Baba temple and were watching dhoop Aarti, suddenly my husband asked shall we go to Shirdi. I was so happy and said yes and cried on seeing Baba. I felt it as a blessing and gift for our anniversary. We booked our tickets for March 6th and were blessed to meet Sai Baba on Thursday. Also I wished to take my parents along with us, yes that too happened with the blessings of Baba (usually my father don't take continuous 4 days of leave). Shirdi Sai devotee Ramya Kiran from India says: Om Sai Ram all, I am Ramya kiran, I am in MP-55, I feel myself very very lucky that Baba made me to be a part of Mahaparayan. After starting Mahaparayan my faith and patience have increased so much. As before that I used take tension for every small problem but after starting Mahaparayan I am leaving all the responsibilities to my Baba. I want share my 2 important and wonderful experiences which happened during Mahaparayan time. Baba selected a very nice person as my husband who loves me so much. I have decided before only that whenever my marriage would get fixed I would send my wedding invitation card to Shirdi, so I had asked suggestions in Baba groups that how to send card to Shirdi. Shirdi Sai devotee Srinivasu V from India says: Om Sai Ram. I am from MP-57 group. Today(12-03-2018) amidst of my busy schedule and being Monday, was lost in pile of work. Around 3pm I got a call from one of our Baba devotees and explaining a serious situation, where in another friend of her was facing. She wanted to help her and suggested to her friend to do Baba’s Satcharitra Parayan to overcome the health challenges. As her friend agreed to soak in Baba stories and Satcharitra, she requested me to share a Kannada Satcharitra. I promised to organise one and share with the needy friend. At 3.45 pm my wife Neelima came back from school and on entering into the home, she realised that, she forgot something in the school cupboard and wanted to go back and bring her belongings home. Shirdi Sai devotee M V Lakshmi from India says: Sairam all of you. I am from MP-55 Kartikeyaa Sai group. Feeling so fortunate and blessed to be part of Khichadi parayan, Mahaparayan, 365 days parayan. Last Wednesday i.e. on 7th March 2018 one of the devotee shared with me her biggest problem and cried a lot for her one and only son's marriage getting delayed as Mangalik/Kuja dosha present in his horoscope. 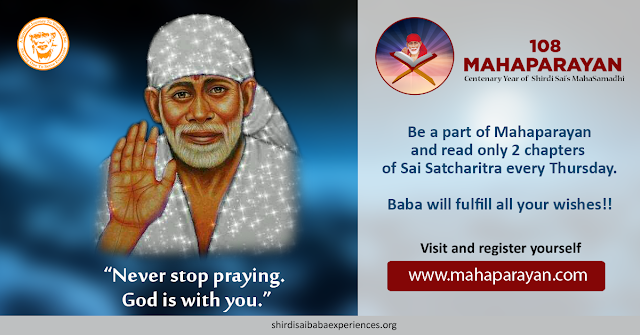 Shirdi Sai devotee Sapna from India says: A small experience I want to share about my husband. Today he had lost his wallet, we tried to search out everywhere in our house where he usually puts his wallet but all in vain. We almost accepted that wallet had been misplaced last night in market. Today being Thursday the Mahaparayan day and I was thinking about Baba ji and was searching the wallet and on that moment I prayed to Baba ji to please help us to find out the wallet and that I will post my experience. Shirdi Sai devotee Nikitha Manya Shivam from India says:Om Sai Ram. I want to share my experience with Baba today. I was volunteering in the ayurveda camp. There was a depression patient who had taken bramhi taila from ayurveda shops for 2 months. But the depression had not come down. Brahmi herb is good for the mind. But in this case the ayur product was not upto the best quality. So my guruji asked us to search for the brahmi herb, make the oil and give it to the patient. It was around 12 noon and very sunny too. We started to make a search in the village as the patient had no much time to wait. Shirdi Sai Baba devotee Anusha Ashok Kumar from India says : Hello everyone my name is Anusha from India. I was married 7 years ago but had no children for 6 years. I got aborted 5 times and every time when it happened I consoled myself that everything will be ok next time, but after all sequences I was depressed and got exhausted but never lost faith on Baba. I used to daily talk to Him sitting in front of Him and cried like hell, but never scolded Him for what I have faced, I am addicted to Baba since 2000, I just questioned Him one thing when is the time? I have good parents and good husband but what to do as I have some chromosomal problem in having children. Shirdi Sai Baba devotee Aruna Dabbara from USA says : Om Sai Ram. The day I started believing Sai, I came across many experiences. Baba has always been there with me for everything in my life, I would like to share a small experience that proved one more time that Baba is always with me and He shows path when all the options closed. I started the week long parayana on fine Thursday and finished the next Thursday. While I was supposed to invite a guest for sharing Prasadam, however there was home improvement work happening at that time, so I couldn't invite anyone. While wondering about the guest, my son's friend wanted to come to our house for playing and then I asked his mom to send him for lunch to share prasadam. However at the last minute, while I was concluding pooja, my son's friend decided not to come on that day and that made me worried as I was not prepared for any other guest. Then I prayed Baba for my options and looked at Him to show a way. Anonymous devotee of Shirdi Sai Baba from India says : I am forever indebted to our Sai and Pooja ji for making me part of Mahaparayan. I used to read devotees’ experiences on devotees’ experiences blog although not that regularly. And one day I saw a series of posts about Mahaparayan but I really didn't read all the posts till the day before registration forms were shared. Next day I was eagerly waiting for P-forms and as there were only few slots I checked the blog every few minutes. As soon as forms were available, there were some issues and I was little bit worried. There was a text box asking to enter the text from image but image was not displayed, I filled the form without entering any text in that text box and tried to submit it but it failed. Second time for some reason I went ahead and typed Om Sai Ram in that text box and submitted the P-form, and the form got submitted! My faith increased even more and I felt like our Sai wants me to be a part of Mahaparayan. Anonymous Shirdi Sai Devotee from India says: Om Sai Ram. I would like to share my experience of going to Shirdi. As on every Thursday early morning I used to go to Shirdi but yesterday(Thursday) till 12 noon I was not able to go to Shirdi as I was not having money in my wallet. I was worried how will I go today. I asked Baba will I come or not today for Your darshan? Then one of my customer came suddenly and gave me money for his order which I had not expected yesterday. This was really Baba Who planned, called me to Shirdi and gave me darshan. Tears were rolling down my eyes thinking how Baba took me to Shirdi. Leelas of Sai are adhbhuth(amazing). Shirdi Sai devotee Sai Maria from Dubai says :Om Sai Ram, yesterday i.e on 8-03-2018 I had experienced a great miracle after completing my Mahaparayan. I was late to go to office. I was in tension. I took my bag and was running to take a taxi. After sitting in the taxi I opened my purse, I was shocked seeing as I had only Aed 30/- in my purse. I didn't know what to do. Yesterday was my 41st & 42nd Parayan. My eyes were full of tears. Taxi driver asked me madam what happened? I said nothing. I took Baba's name and opened my Sai Diary what a surprise, I found Aed 50/- inside it. Shirdi Sai devotee Shireesha from India says: Sairam everyone. 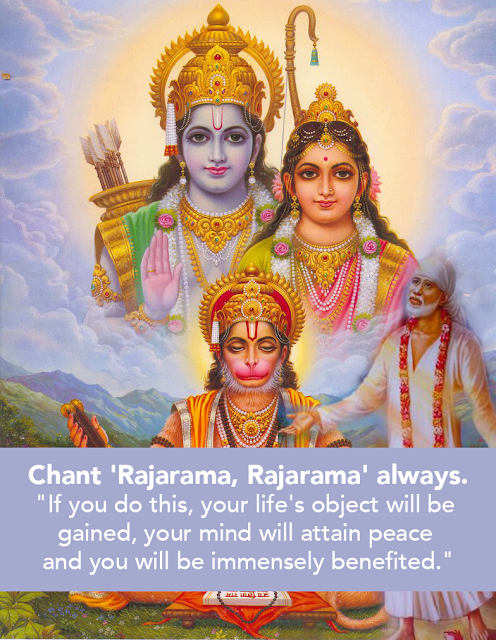 I would like to share how Baba helped me to complete all my parayans. 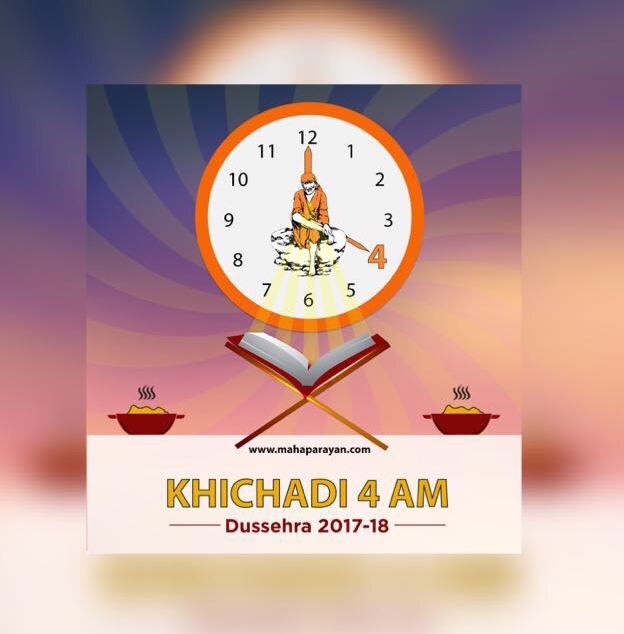 Last night (7-03-2018)was chatting with few devotees and reading their experience in different groups and it was around 1 am, more over I had severe leg pain and could not sleep and being Thursday I had to get up by 3 am to do khichadi parayan. I saw my phone and it was already 1:30 am, I told Baba it is already 1:30 am and getting up by 3 am is highly impossible and Baba I think today I will miss reading my parayan or should I take help of my sister to complete parayan? Baba I don't know how I will get up and till date I have not missed reading any of the parayans. I slept thinking about it. Shirdi Sai Devotee Muskan from India says : Sai Leela Anant. Sairam everyone, I am from MP-23 Sukrity Mahaparayan group. This is my beautiful experience saying how Baba blessed me to do His seva in Naam Jaap. On 24-3-18, I was reading Mahaparayan experience of a Sai Bhakta. I came across one divine experience where one lady had experienced the wonderful Leela of Deva and also she is doing seva in Naam Jaap and how Baba blessed her during seva(as described in post). 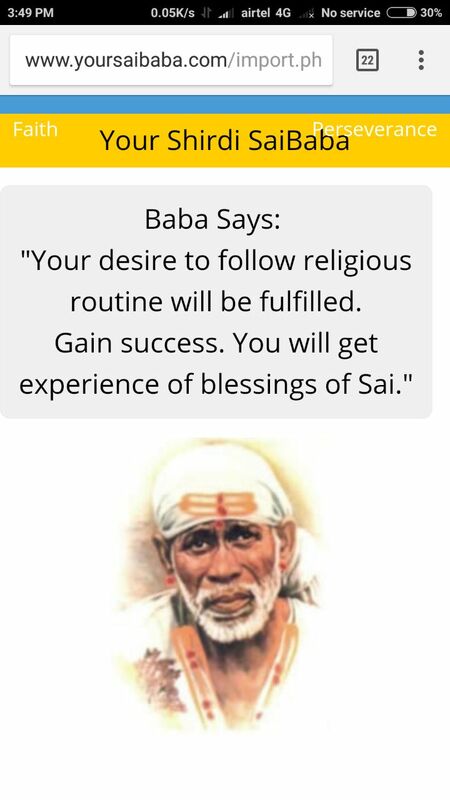 After reading that, I thought how lucky and blessed are all of those, whom Baba has chosen to do His seva, I wish even I too get a chance to do it. Shirdi Sai Baba devotee Nikita Wasnik from India says: I have this miracle of Baba. It goes like this I have a laptop which doesn't work without charging as my battery is exhausted more than two years. I always miss "Mere Sai" serial of Sony tv as there are lots of disturbances around. 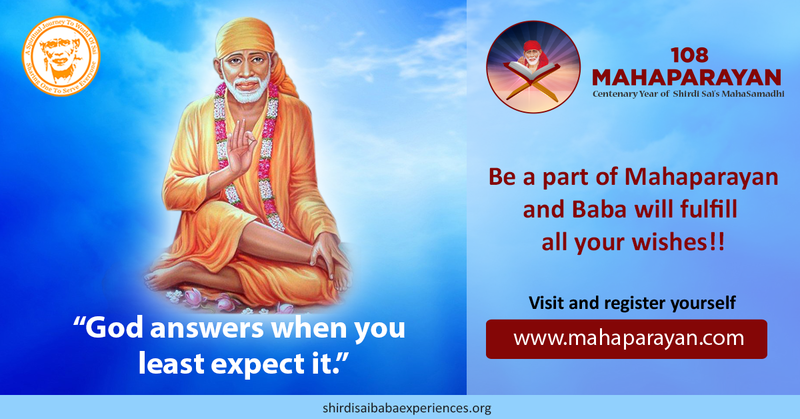 Anonymous devotee of Shirdi Sai Baba from India says: Hi, I want to share the experience that, how Baba guided me and helped me to control sugar levels of my mother. My mother was not having any health issues and she was always active, fit and fine. But her sugar level got raised, that too without any symptoms of Diabetes. We got really tensed as I didn’t want to see her suffering and always wanted to see her healthily and happily. So we decided to control her sugar levels naturally without taking any medications . I googled the food list that controls diabetes and asked my mother to use the same. I used to cry and request Baba to cure naturally. She completely stopped eating rice and within a month her sugar level came down to normal range. The day before to checkup I remembered Baba and guessed what could be her sugar level this time? To my surprise my guessed readings and the readings given in the report were almost same. But after this it started increasing again (as it was not completely controlled). Then we planned to continue the same food with less rice for few more days and also we added millets in her diet. This really worked and with Baba’s grace and with regular exercise, now her sugar levels are in control and if the same diet is maintained for 3-4 months, hope she will be free from diabetes. Due to this I couldn’t concentrate on my studies and even my health got upset. Now I’m fine with Baba’s grace and vowed to write this after getting fine. I am searching for a job. Hope with Baba’s grace I will get a job and my mother’s health also will be fine. I request Sai devotees to pray for the same. Baba never neglects His devotees but protects them at all the times. He never disappoints the true prayers offered wholeheartedly. It may sometimes take time but He surely answers them. Love You Sai Maa. Jai Jai Ho Sai...! Shirdi Sai devotee Kamala from India says: Sairam everyone. Nearly 15 days back I had been suffering from severe back pain where I couldn't even breathe properly, was unable to do my household work, unable to sleep, unable to feed my 2 year baby, suffered a lot and even took medicines but was of no use. Some suggested me to have a bandage with some ginger and turmeric and to have a hot water bag, I did everything but it too was of no use. Suffered nearly for three days and on the fourth day I sat before Baba to do pooja and I was talking to Baba (Baba this is an unbearable situation for a mother where she can't even feed her baby, it’s paining a lot, I am unable to lift my hand, Baba please help me and remove this pain) and suddenly took a pinch of Udi from Agarbatthi (which I had lighten before Baba) that had fallen down. Shirdi Sai Baba devotee Amarprit Brar from Africa says:Om Sai Ram everyone. It is about Udi. We got our home fumigated last Saturday. First the person fumigated outside as I was making arrangements inside. My both the dogs Rocky and Bruno were inside. As he completed garden and lawn he wanted to spray inside. So I asked him if it was safe to tie my dogs outside and he said it was almost 5 hours and I could tie. So my son and I decided to visit temple and tied Rocky and Bruno out under summer hut as it was hot. We went to temple and went to buy grocery and stuff. So we spent almost 5 to 6 hours outside. As we were coming back my security called me that Madam Bruno was vomiting. My heart came to my mouth and we rushed home. I cleaned the whole house and set everything. 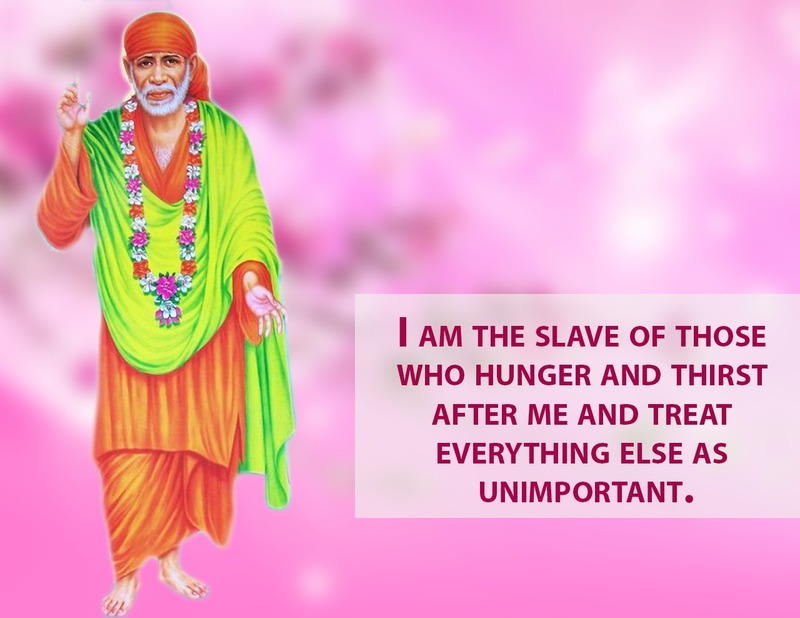 Shirdi Sai Devotee Ritu C from India says: Sairam everyone, I am Ritu C, class Teacher For Mp-16 & Mp 17, AASM-Wednesday, Vice Principal - Shraddha School and sewak of various other Baba’s service groups. I have been Baba’s child always and He the merciful Sai has also always showered His love on this beti (daughter) of His ,By Baba’s grace there are innumerable experiences and miracles that these young eyes have been witness to, but this one particular experience is very special to my heart and hence I am sharing this as my first experience on this blog, and the experience is as follows. My husband saw an early morning dream in which he saw that me and my husband were in our hall and we could sense that someone was in our room. So we went into the room to check and when we entered our room we saw Baba standing on 2 sides of our 2 Walls in L shape. Anonymous devotee of Shirdi Sai Devotee from India says: Sairam everyone. Today I experienced a miracle of Baba. Today in morning I had lunch order of 200 people. Everything was perfectly ready according to my menu and I served the food but as the first 30 to 35 people had lunch, they came to me and they told me that today's food was not tasty. I couldn't understand what had happened? I started to check everything but I couldn't understand what was wrong? When all people had food, I was still in tension thinking what might have happened today? Shirdi Sai Devotee Gowri Oberoi from India says: Sairam everyone. 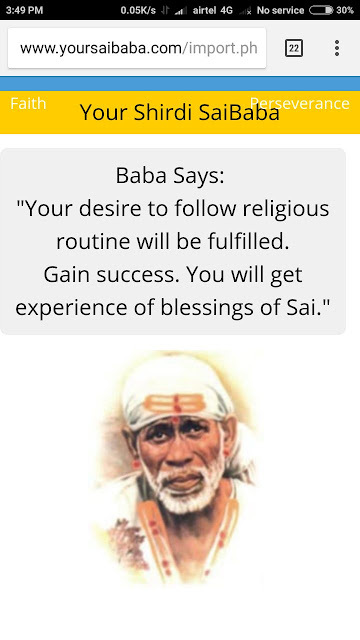 I am Gowri Oberoi from New Delhi and have been wishing to visit Shirdi before my daughter’s 10th board exams beginning tomorrow i.e. on the 12th March, 2018 but knew that only when Sai wishes He will call me. Just like devotees sent their request through Baba’s dear one Shama ji, I had requested Pooja Garg ji to request Baba to grant me His Samadhi mandir and Dwarkamai darshan when she visited Shirdi last some days ago which she did. But somehow Baba still didn’t accept. A few days ago when I saw that my visiting wasn’t possible, I asked my husband if he can go alone and have darshan. He planned to go today and even made his bookings. But Baba didn’t allow him also and he had to cancel. I was of course disappointed. Just when I was thinking about this, my daughter gave me a courier packet. 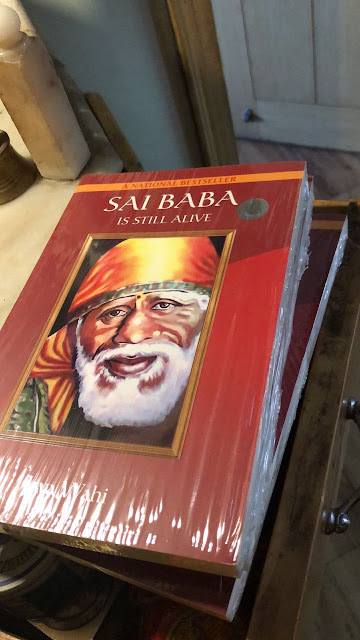 I opened it and saw to my surprise it was the books “Sai Baba is Alive” by Jaya Wahi ji. I had ordered a few copies a couple of days ago and it wasn’t expected to arrive before the 14th of this month! Baba saw my disappointment and came home in the form of His book reassuring me that He is with me. 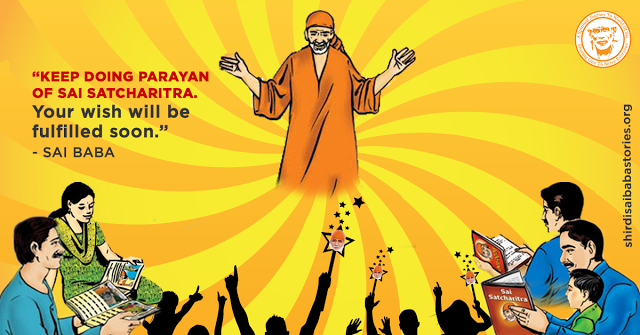 As said in Sai Satcharitra that no one can step in Shirdi nor can anyone leave Shirdi unless Baba wishes. Baba has His own timings for everything and it’s just perfect! 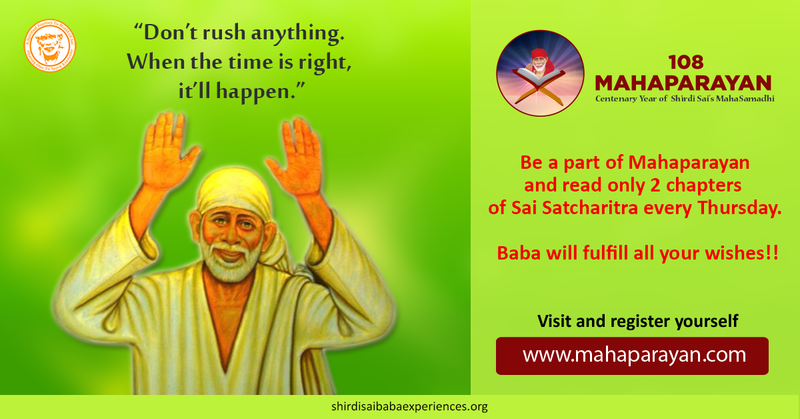 We just need to trust His timings believing that He will do what is best for us, and for that He also always emphasized the Gurumantra “Shraddha” & “Saburi” ! Love You Saimaa. Jai JAi Ho Sai. Shirdi Sai Devotee Gowri Oberoi from India says: Sairam everyone. I am Gowri Oberoi from New Delhi, a small servant of Baba serving Baba as Principal of Anant Akhand Sai Mahajaap Monday Group, Class teacher of MP-19, Class Teacher of 365-4 group and also member of BMP Khichdi group all by Baba’s amazing blessings. I would like to share how Baba gave me darshan again today (Monday, 5-3-2018) twice. On the same evening before Anant Akhand Sai Mahajaap started at 11.55pm, Baba came to my home in the form of 100th centenary calendar from Shirdi. After Anant Akhand Sai Mahajaap began, since many days I had been wishing for Baba to come to my home in the form of Pandharinath Vitthal and today when my Monday group was doing Naam jaap and my jaap time started (5.40pm to 6pm), while chanting I wondered in my mind whether Baba is accepting all our jaap and prayers or not and asked Baba to show me some indication. Later after dinner I was watching Mere Sai serial on tv and got tears of joy when in that show Baba gave me darshan in the form of Pandharinath Vitthal and also showed me that He and Vitthal are one and the same! It was so beautiful I clicked a photo of that scene. Then after some time I wanted to see Shirdi live darshan on tv without knowing what time it was and switched to active darshan and as it was after 11pm the shrine was closed so I just pressed the next screen arrow on remote and all shrines were closed and suddenly one screen had live darshan and guess which temple it was?? Yes! It was Pandharinath in Pandharpur temple live! Isn’t that amazing? I didn’t even know till today that they were showing Pandharpur live on active darshan. Baba the Vitthal Incarnate knows the smallest of the desires of His billions of His devotees and that's what makes Him Big. He is the most merciful, loving and concerned mother for all His childfen and their spiritual upliftment altogether. Blessed to be Your Children Sai. Love You Sai Maa. Jai Jai Ho Sai...! Shirdi Sai Devotee Navithaji from India says: Sairam everyone. I am Navitha from Vijayawada.I want to share a small miracle which happened today. Generally I used to think everyday that all are experiencing Baba's leelas after starting Mahaparayan and I haven't experienced anything but today I have experienced a miracle which I couldn't forget in my lifetime which made me utmost happy. Now coming to my experience, every Saturday I used to visit Balaji temple. Today also I woke up early in the morning and in a hurry to reach the temple as early as possible I hadn't kept my earrings properly. I thought everything was perfect and took my scooty and left to temple and had darshan of lord Balaji. The temple was very crowded as thousands of pilgrims would visit on saturday as it is more powerful and it is called Konaseema Tirupathi. Shirdi Sai Baba devotee Krithika Ji From India Says : Om Sairam! My name is Krithika. I am living in Chennai. I am doing parayan in MP 112 Lavina Sai Group Yellow house Roll num 41. Yesterday my Husband told me how Baba saved his life and took him to his office and blessed him. This happened on 26th Monday morning. Around 11 am my Husband Mr. Subramaniam an LIC agent boarded a bus and slipped and fell down before the wheel. Another small jerk means he will be ran over. But the bus stopped suddenly and few passengers helped him to sit. He was unconscious. He could not speak. No injuries or blood wounds or bruises. At that time three old men in white dress came in a big white car. They stopped near the spot and enquired, searched his bag and got his contact details. As I am a dialysis patient I was not be in home. So they somehow contacted my neighbour and they said I was not in house and Mr. Subramaniam is working in LIC Ambathur OT as LIC agent. So those three men took My Husband to the Office and left him. The office people said he is a very nice man and received him along with those three men in whites. Subramaniam said Baba only saved him. At that time one of them have told me to remove his shirt and he applied Udi on my whole body with his hands. Blessed him by putting His hand on his head and said "Nothing will happen to you. I will always protect your family". Then all the three have disappeared. The office people also had seen all these three persons in white but they could not sense this Happening. After gaining consciousness Subramaniam also realised that it was Baba and He had saved his life, blessed him and also removed all the bad effects by His divine golden touch and by applying Udi ! There was not even a small scratch or drop of blood. So Thank You all for making me a part of Mahaparayan! 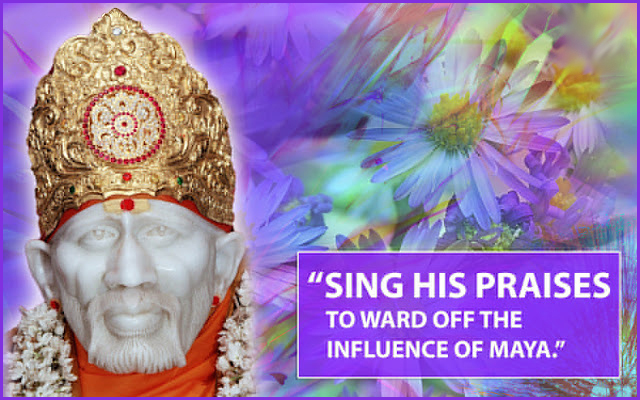 Anantha koti Namaskarams to Shirdi Sai Baba! Thanks for all the member which in Baba's rupam theivam manusha rupena. Jaako Rakhe Saiyaan Maar Sake Naa Koi(Meaning-Nothing Can Harm The Blessed One Whom God Protects). Blessed are you and your husband to experience Baba so closely. Blessed is he who knows the greatness of his Guru and thinks him to be Hari, Hara and Brahma (Trimurti) Incarnate. The first thought that came to my mind while reading about 3 men in white is that Baba came as Trimurty The Creator, Preserver and the Destroyer (Brahma, Vishnu And Mahaeshwara!!!) and saved your husband from the clutches of death. Love You Baba. Jai Jai Ho Sai!